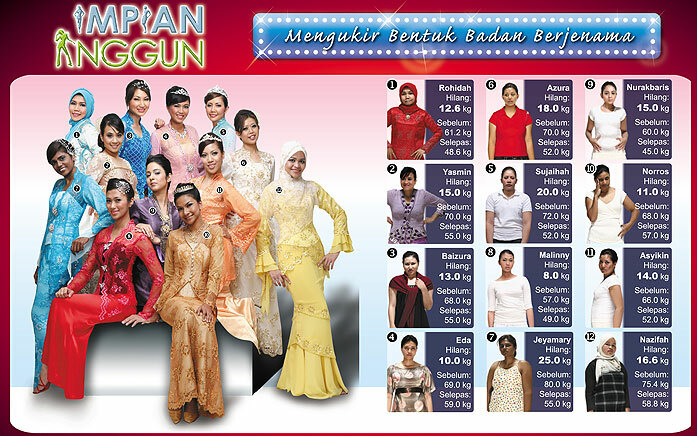 Impian Anggun are the very first Malaysia true story slimming and beauty reality show in Malay content. Having been in the slimming industries for so many years, Mayfair Bodyline is expertise and confidence to help Malaysian and Singapore ladies to flaunt their branded figure and reveal their flawless beauty! The Impian Anggun offered a “women’s zone” that provided all in one beauty and slimming’s info and tips to help women regain their self-confidence by resolving their weight and skin problem. After the show is on Air, we had received overwhelming response in nationwide branches. It is a great milestone to us; which inspire the ladies to fulfill their desirable body curve and refine your beauty! With Mayfair Innovative Slimming machine, ladies now can achieve that long converted figure with state-of-the-art slimming technology. If you have battling the extra bulge of your for years, with little or no result, Mayfair offer you the opportunity of a life-changing moment! All participants are proudly to share with audience how Mayfair and Ree's Skin helping them to shape for branded figure and regain flawless beauty. If you had missed the early show, now you watch the Impian Anggun on our YouTube Channel. With the largest range of slimming and beauty programmes, we offer the entire customer the freedom to mix and match the slimming and beauty programmes according to their preferences. Watch all these video and only decide whether you want to choose us! Mayfair Group has the innovation that inspires curvy appearance!